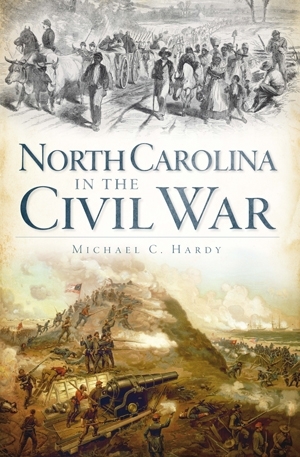 North Carolina In The Civil War, Michael C. Hardy, History Press, 160 pp, 73 illustrations, bibliography, 19.99. Clear and concise, North Carolina In The Civil War covers the essentials of a Confederate state with conflicting loyalties. Organized chronologically, Hardy's work flows smoothly from 1861 to 1865, the Reconstruction Era, and the Memorial Era. Tucked in between chapters 5  and 7 [Reconstruction] is a chapter entitled Tar Heels To Front. Chapter 6, tightly organized, covers quite a bit of ground regarding North Carolina's regiments. Certainly a quite a bit more could be stated regarding the Old North State's soldiers but the publisher sets the page count. The concluding chapter, 'Looking for the Civil War in North Carolina Today' is helpful. North Carolina In The Civil War offers a wide range of topics such as the blockade and blockade runners, dissent and desertion, and consumer prices and conscription practices. Hardy offers an even handed treatment of Confederate patriots, Union loyalists and their conflicts. He avoids discussing Tar Heels feelings on the extension of slavery into the western territories. Also, he occasionally describes political parties as being either 'liberal' or 'conservative' that may be confusing in light of the 19th century and current understandings of the words. Helpful would have been the inclusion of a county map, a land form and river map, and an population centers map. A final tally of military enlistments, combat deaths and damages inflicted upon civilians as compared to the other states in the Confederacy would have been intriguing to see. Overall, though lacking footnotes or endnotes, Hardy' s North Carolina In The Civil War is a fine model for others who are seeking to write a brief history their state in the Civil War. Producer: U.S. Army Pictorial Service, Signal Corps. Director: John Huston. Writers:Charles Kaufman and John Huston.Photographers: Stanley Cortez, John Doran, Lloyd Fromm, Joseph Jackman and George Smith. Narrator: Walter Huston. Music:Dimitri Tiomkin. Editors: William Reynolds and Gene Fowler, Jr. Transfer Note:Transferred from a 35mm B&W negative preserved by the National Archives and Records Administration. Running Time: 58 minutes. John Huston’s World War II documentary Let There Be Lightis so legendary for its censorship controversy that its sheer power as a film has been easy to miss. Produced by the U.S. Army in 1945, it pioneered unscripted interview techniques to take an unprecedented look into the psychological wounds of war. However, by the time the film was first allowed a public screening—in December 1980—its remarkable innovations in style and subject, which in the 1940s were at least a decade ahead of their time. Producer: U.S. Army Pictorial Service, Signal Corps. Director: John Huston.Writers: Charles Kaufman and John Huston. Photographers: Stanley Cortez, John Doran, Lloyd Fromm, Joseph Jackman and George Smith. Narrator:Walter Huston. Music: Dimitri Tiomkin.Editors: William Reynolds and Gene Fowler, Jr. Transfer Note: Transferred from a 35mm B&W negative preserved by the National Archives and Records Administration. Running Time: 58 minutes. John Huston’s World War II documentaryLet There Be Light is so legendary for its censorship controversy that its sheer power as a film has been easy to miss. Produced by the U.S. Army in 1945, it pioneered unscripted interview techniques to take an unprecedented look into the psychological wounds of war. However, by the time the film was first allowed a public screening—in December 1980—its remarkable innovations in style and subject, which in the 1940s were at least a decade ahead of their time, could be taken as old hat, especially because of the poor quality of then-available prints. This new restoration finally reveals the film’s full force. 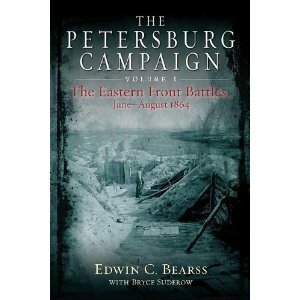 The Petersburg Campaign: The Eastern Front Battles, June - August 1864, Volume 1, Edwin C. Bearss Bryce A. Suderow, Savas Beatie, LLC, hardcover, 8 maps, bibliography, index, 488 pages., $34.95. 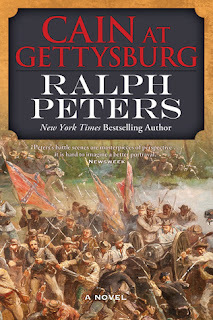 Volume One: The wide-ranging and largely misunderstood series of operations around Petersburg, Virginia, were the longest and most extensive of the entire Civil War. Thefighting that began in early June 1864 when advance elements from the Union Army of the Potomac crossed the James River and botched a series of attacks against a thinly defended city would not end for nine long months. 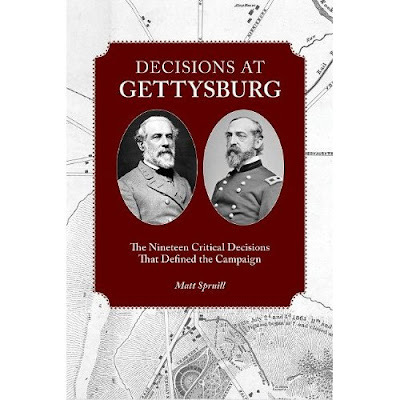 This important-many would say decisive-fighting is presented by legendary Civil War author Edwin C. Bearss in The Petersburg Campaign: The Eastern Front Battles, June - August 1864, the first in a ground-breaking two-volume compendium.Although commonly referred to as the "Siege of Petersburg," that city (as well as the Confederate capital at Richmond) was never fully isolated and the combat involved much more than static trench warfare. In fact, much of the wide-ranging fighting involved large-scale Union offensives designed to cut important roads and the five rail lines feeding Petersburg and Richmond. This volume of Bearss' study of these major battles includes:The Attack on Petersburg (June 9, 1864)The Second Assault on Petersburg (June 15 - 18, 1864)The Battle of the Jerusalem Plank Road (June 21 - 24, 1864)The Crater (July 30, 1864)The Battle of the Weldon Railroad (August 18 - 21, 1864)The Battle of Reams' Station (August 25, 1864)Accompanying these salient chapters are original maps by Civil War cartographer George Skoch, together with photos and illustrations. The result is a richer and deeper understanding of the major military episodes comprising the Petersburg Campaign. The Petersburg Campaign: The Western Front Battles, September 1864 - April 1865, Volume 2, Edwin C. Bearss and Bryce A. Suderow, Savas Beatie, LLC, hardcover, 14 maps, 22 illustrations, 504 pp., $34.95. 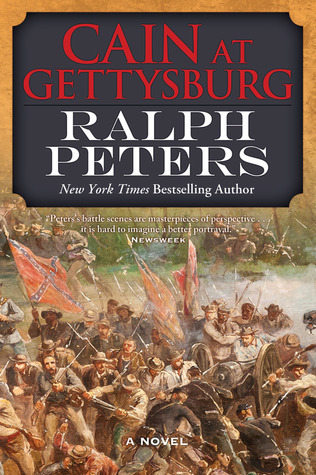 Volume Two includes these major battles: Peeble’s Farm (September 29 – October 1, 1864), Burgess Mills (October 27, 1864), Hatcher Run (February 5 – 7, 1865), Fort Stedman (March 25, 1865), Five Forks Campaign (March 29 – April 1, 1865), and The Sixth Corps Breaks Lee’s Petersburg Lines (April 2, 1865). This volume of Bearss' study includes these major battles:- Peeble's Farm (September 29 - October 1, 1864)- Burgess Mills (October 27, 1864) - Hatcher Run (February 5 - 7, 1865)- Fort Stedman (March 25, 1865)- Five Forks Campaign (March 29 - April 1, 1865)- The Sixth Corps Breaks Lee's Petersburg Lines (April 2, 1865) Accompanying these salient chapters are original maps by Civil War cartographer Steven Stanley, together with photos and illustrations. The result is a richer and deeper understanding of the major military episodes comprising the Petersburg Campaign. Edwin C. Bearss is a world-renowned military historian, author, and tour guide known for his work on the American Civil War and World War II. Ed, a former WWII Marine wounded in the Pacific Theater, served as Chief Historian of the National Park Service from 1981 to 1994 and is the author of dozens of books and articles. He discovered and helped raise the Union warship USS Cairo, which is on display at Vicksburg National Military Park.Bryce A. Suderow is a Civil War writer and researcher living in Washington, D.C. He received his B.A. at Knox College and earned a Masters in American History at Sonoma State University. His Masters' Thesis, Thunder in Arcadia Valley, was published in 1985 (Univ. of Missouri). Bryce has also published many articles in a number of Civil War periodicals and is recognized as one of the finest archival researchers working today. SHOOTING SOLDIERS: Civil War Medical Photography by Reed B. Bontecou, MD by Stanley B. Burns, MD is the first exposé of clinical photography taken during the war from May 1864 through Spring 1865. The images reveal a new significant chapter of Civil War history. A biography of the surgeon-photographer Reed Brockway Bontecou, MD Surgeon in Charge of Harewood US Army Hospital is included as well as discussions of death and dying. Tables of the units and battles they were in accompany the text. This new work will be a major contribution to Civil War history. Of the vast research on the Civil War this is something new. The subject of this book is one of them – clinical photography during the war – and the images are artistically posed in the style of the masters of photography, making them major works of art. There have been dozens of books and articles describing medical aspects of the war but none have, nor could they have presented a history of clinical war photography as Dr. Burns owns the largest collection of clinical images taken during the war and has not heretofore published an exposé of them. 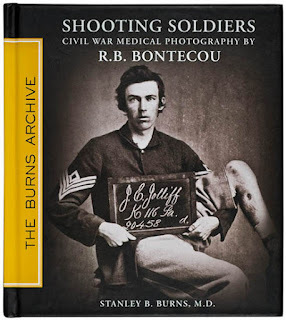 In 1980 he published Early Medical Photography in America (1839-1883) – Medical Photography in the Civil War, which has remained the definitive analysis of the use of photography by, of, and for physicians in the war. This current work is a scholarly extension of that study using the 570 clinical cartes de visite photographs in the Harewood US Army Hospital Album. Bontecou’s photographs are beautiful, artistic representations of photographic art that transcend the subject. This book will become a classic and has been heralded by the Civil War medical historians who have seen the images and text as it was produced. Michael Rhode, Chief Archivist of the Otis Historical Archive, National Museum of Health and Medicine wrote the forward. He notes "that the presentation of these images is a great service as even I have not seen most of them." All of previous Burns Archive publications have been large coffee table size and we have now started to produce books as smaller, easily handled, and carried volumes. Shooting Soldiers… is produced as a fine art photographic text and is coupled with information not available anywhere else. Perhaps to get a better understanding of his work you can see the video on The Burns Archive, which is the number one viewed program on Newsweek.com (The Burns Archive on Newsweek), or his current CBSNews.com medical photography series, also number one these past weeks (The Burns Archive & CBS News: Cancer in the 1800s and The Burns Archive & CBS News: Smallpox). I also encourage you to visit our blog where we showcase various highlights of the collection as well as announce upcoming exhibits, etc. Several museum exhibitions of Bontecou’s clinical photographs will be presented over the next four years. The first is currently at New York’s Merchant House Museum titled New York in the Civil War… April 11–Aug 2011 and was reviewed by the Wall Street Journal on July 16, 2011. Several other venues are scheduled. Among the major museums planning to use Bontecou clinical photographs in their exhibits are the Houston Museum of Fine Arts (2012) and The Metropolitan Museum of Art (2013). If you decide to review this book, please let me know and I will send a copy. Official publication date is July 2011. The book is currently available from The Burns Press, retail price $50.00, Case Bound, 6 by 6 3⁄4 inches, 168 pp, ISBN 13978-1-936002-05-4. The Fate of War: Fredericksburg, 1862, Duane Schultz, Westholme Publishing, endnotes, bibliography, index, 306 pp., 35 illustrations, 4 maps, 2011, $28.00. The Battle of Fredericksburg [December 1863] is often reduced to the gallantry of the Federal assaults on the stonewall at the foot of Marye's Heights. Recently through, the work of scholars including National Park rangers have provided a more detailed research on both the entire battlefield and the city of Fredericksburg. Duane Schultz's The Fate of War: Fredericksburg 1862 provides an entry point to other stories of the battlefield and the town. Schultz offers human interest stories to propel his account forward. The Fate of War's Prologue provides an example. Near the stonewall Sgt. Thomas Plunkett's are torn from his body by an exploding shell and in the battle damaged tow Clara Barton offers aid aid to soldiers. Newspaper correspondent Murat Halstead writes to the Cincinnati Commercial a story of soldiers' valor. Succinct biographies are used throughout establish the background to the battle and to propel the story through the winter of 1863. The motivations, passions, and emotions of the soldiers and civilians are reveal in their letters, diaries, and memoirs. Bibliographic notes are not numbered but organized by chapters and pages. Westholme Publishing often takes care with its books' spines and binding. The Fate of War is no exception. The book is comfortable to hold and the pages fall open easily. The Fate of War is accessible to high school students and readers in general. Lincoln And The Election of 1860, Michael S. Green,152, pp., Southern Illinois University Press, 2011, bibliographic notes, index, $19.95. One of the new titles in Southern Illinois University's Concise Lincoln Library series, Lincoln And The Election of 1860 is a fine work. Michael S. Green's narrative is clear and direct; every sentence is lean and concise; the pace never falters. Events, decisions, and personalities are described by to-the-point anecdotes and on-the-money-quotations. Green offers the best of recent Lincoln and American political party scholarship. Elbow by elbow conversations reveal the principles and political savvy, the borders and brinksmanship of Lincoln, his allies and his opponents. Green's first two chapters offer a cogent description of the American political party system to 1850. He captures the essence of the era's politics with two quotations from Thomas Jefferson. Jefferson's 1801 inaugural address 'We are all republicans; we are all federalists' statement is contrasted by his later statement in a letter that 'I shall . . . sink federalism into an abyss from which there shall be no resurrection for it.' The first and second party systems, the founding of the Whig Party, and the great debates of the 1850s are fully sketched. The Republican field of candidates, Lincoln's perception of himself and his perception of how others view him is the cornerstone of the book. Greene relies upon Lincoln's remarks and those of others to clarify the issues. The Constitution, the federal union, the election of 1860 are offered as understood by those at that time. Eager to give no offense to others, Lincoln creates a meandering path to the White House; others paint themselves into a corner and Lincoln keeps his feet out of their paint. Green wonderfully describes the Illinois Republican Party's presidential nominating convention at which 'The Rail Splitter' is lifted up by the attendees and literally passed forward to the stage. Greene's story climaxes during the Republican national nominating convention and the elections of October and November balloting process. Michael S. Greene has succeeded in crafting a clear and concise narrative. It is one that offers a fine summary of Lincoln's efforts, the endeavors of his friends and the political climate of the presidential campaign of 1860. Blessedly Greene does not set forth observations on the political environment of 2010s, which has become a habit of other scholars sesquicentennial books. Lincoln and the Election of 1860 is accessible to advanced placement high school students, undergraduate and graduate readers. The Civil War At Perryville: Battling For The Bluegrass, Christopher L. Kolakowski, History Press, 2009, 189 pp., 38 illustrations, 17 maps, appendices, notes, bibliography, $21.99. The Civil War At Perryville: Battling For The Bluegrass offers a straight forward account of the autumn 1862 Kentucky Campaign. Readers unfamiliar with the campaign should prepare for Kolakowski's work by using Shelby Foote's the Civil War: A Narrative--Fort Sumter to Perryville [volume I] places the campaign in both a political and military context. Also readers may also review online resources such as http://www.battleofperryville.com/ and The Civil War Trust's http://www.civilwar.org/battlefields/perryville.html?tab=facts. Kolakowski sketches the personalities of the commanders and terrain features of the campaign; his narrative is well organized and well paced. Most readers will find The Civil War At Perryville a good introduction; others may wish to read a more comprehensive treatment such as Perryville: This Grand Havoc of Battle by Kenneth W. Noe. Deficits of the book include the poor quality of several reproduced portraits. The maps appear to be poor photocopies of previously photocopied topographic maps. An Order of Battle for Kirby Smith's Confederate army is missing, though an Order of Battle for Buell's Federal army and Bragg's Confederate army are offered. A chronology would have been helpful for understanding sequence of events for three armies. Also an index would have been made it possible for readers to follow a person or an unit through the campaign. There are extensive scenes with George Gordon Meade, the Federal commander and Robert E. Lee, the Confederate commander. Meade is the center of scenes regarding Federal military leadership; Lee is often viewed through the eyes of Longstreet, a Confederate corps commander. Sickles, Federal corps commander, drives the story forward at times. Peter's expertise as a army veteran intelligence officer and strategist comes to the fore in these characters' interior thoughts. Among these generals, it is Meade and Sickles that are most fully described. Meade, who took command of the Army not quite three day before the battle, becomes exhausted in course of six days. Sickles, who left his troops right after the May 1863 battle of Chancellorsville, returns less than three full days before the July battle of Gettysburg. He is the politician-on-the-make who needs battlefield glory to rehabilitate his career from a pre-war murder charge. The Confederate officers are exhausted and aware that their futures are in the balance during the battle. They each realize that imminent capture of Vicksburg, Mississippi will tip the war's balance as would a defeat in Pennsylvania. Perryville Battlefield Adds 140 Acres, Joanna King, The Advocate-Messenger, May 2, 2012. Much like winning a battle one field at a time, Perryville continues to capture more of the land that shaped the identity of a region and, ultimately, a nation. 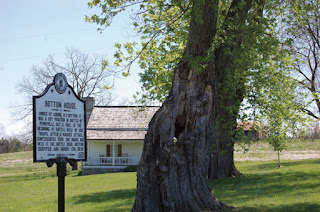 James R. Overstreet and Pat W. and Lora June Overstreet have transferred ownership of more than 140 acres on Hayes-May Road to the Civil War Preservation Trust for $725,000, according to a deed filed recently at the Boyle County Clerk’s Office. Joni L. House, preservation specialist and program coordinator for Perryville Battlefield State Historical Site, said the acquisition represents an opportunity to keep a piece of history intact that might otherwise be lost to development. “In Franklin, Tenn., the site of a historical battle was only preserved after the tract was purchased and the Pizza Hut that had been built on there torn down,” she said. The Civil War Preservation Trust is a national non-profit supported by donors who believe like House does that such areas should be off limits to development and available for future generations. House was raised on battlegrounds by a father who was a history teacher. Her husband and son are re-enactors, and their home resembles those of the Civil War era. “Ihave a churn, and I even know how to use it,” she said. “My middle name is ‘Lee’ if that tells you anything,” she said, an apparent reference to Robert E. Lee, general of the Confederate army. The latest property acquisition in Perryville picks up where the gravel road that intersects the battlefield ends. “It is the land that surrounds the Bottom House,” she said. According to House, H.P. Bottom went to bed one night the first week of October 1862 a wealthy man comfortable in his place in the world and woke up in a world that would never be the same with all he knew destroyed by a war in his own backyard. “I think we are still suffering on some levels from what happened here,” House said, speaking about the economic direction the town was headed before war set it back. The beautiful rolling green hills became “hell on earth” littered with the dead and dying, she said. Preservation of the battlefield pays homage to the 2,500 who died. The Civil War Preservation Trust hopes to acquire even more land in the area. It is soliciting donations to purchase a 122-acre tract known as the “Slaughter Pen.” Other property for potential purchase includes a 60-70 acre tract. According to the trust website (www.civilwar.org/battlefields/perryville.html), every $1 donated multiplies to $3.28 because of available matching and other grants. Registration is also now open at www.perryvillebattlefield.org to participate in the 150th commemoration of the Battle of Perryville scheduled for Oct. 5-7 in which 100 percent of funds raised will go toward preservation efforts.